AirVenture was a blast at the IAC Pavilion! For the first time we went "LIVE" on social media. Catch up with us on Facebook, Twitter and Instagram. Special thanks goes out to Megan and Kaylin Hart, our AirVenture Interns for all the interviews and photos. We had over 135 IAC members sign in on our guest book at the IAC Pavilion. Folks from as far as Australia and Great Britian as well as locals from Kenosha and Appleton, Wisconsin. About 50 airplanes parked out front including; Pitts, Yaks, Eagles, Decathlons, a couple of Staudachers, EXTRAs, and our anniversary airplanes - DR-107 "One Design" and Acro Sport I & II. Many of the forums held at the pavilion were standing room only. Thank you to all of our forum speakers! Check out the speakers and their topics HERE. 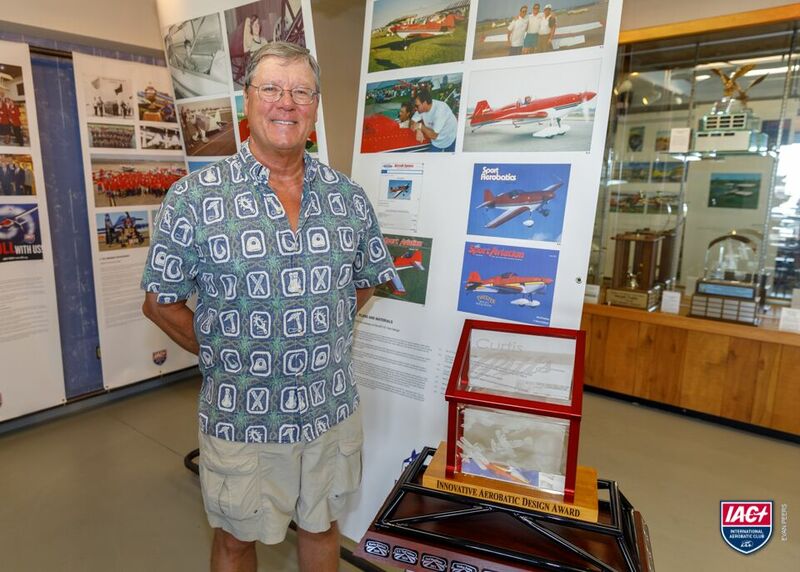 Trophy recognizing Dan's outstanding contribution to aerobatics through product design. On Thursday the Charlie Hillard Award was presented to Rob Holland by IAC President Robert Armstrong. 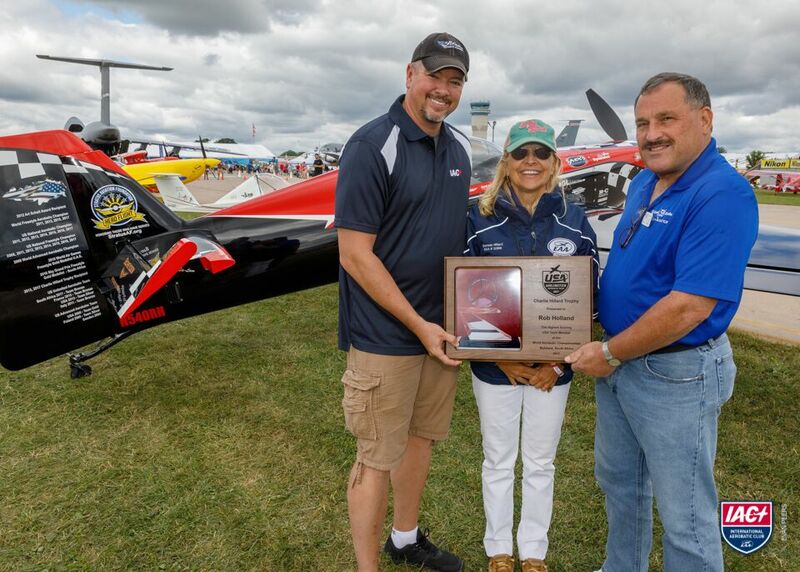 The award is given to the highest scoring American at the World Aerobatic Championships the prior year. (2017) This is the first time the award has been presented to the Hillard award winner by a former Hillard award winner. Pictured in the photo from left to right; Rob Holland, Doreen Hillard (widow of Charlie Hillard) and Robert Armstrong. Friday evening the IAC held its annual gathering of members at the Nature Center. Over 150 members enjoyed the food, beverages and camaraderie. The evening included presentation of the Annual Volunteer Awards; Kathy Jaffe Volunteer Award recognizing Alice Johnson as the outstanding volunteer in 2017, Harold E. Neumann Award for Outstanding Chief Judge went to Michael Church, Robert L. Heuer Award for Judging Excellence presented to Michael Gallaway, and the Frank Price Cup recoginzing Tony and Julia Woods as those who contributed the most to the sport of aerobatics in 2017. All details on the award winners can be found on this page. Also on Friday evening representatives from Metropolitian Statue University Denver and University of North Dakota were present to accept their Collegiate Awards. Results from the 2017 IAC Collegiate Competition for both team and individual categories HERE. Special thanks to Jordan Ashley, IAC Collegiate Program Chair and Michaell Lents and Dagmar Kress (committee members) for all your work and support for the collegiate program. Visit the AirVenture 2018 photo gallery in the coming weeks for photos from AirVenture! Hope to see you all next year at AirVenture 2019.